Cathal Johnson, harmonica player, in his workshop where he repairs the instruments. Photo: Mike Shaughnessy. 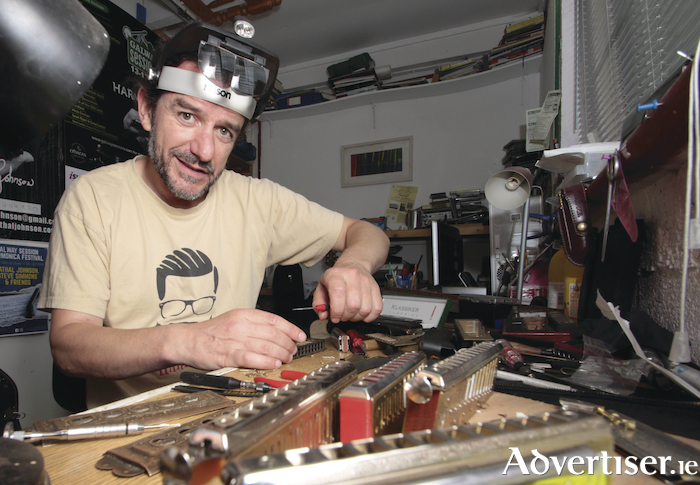 Nestled amid the cluster of arts and crafts enterprises to be found around the small courtyard of The Forge, in New Road, is the workshop of Cathal Johnson, player and repairer of harmonicas. Harmonicas of all shapes and sizes crowd his worktop on the day I visit, ranging from a choral orchestral harmonica which is over a foot long to the miniscule ‘Little Lady’ harmonica. The orchestral harmonica belongs to actor and musician Patrick Bergin, with whom Johnson has performed in the past — and they will be gigging together again soon with The Dominic Street Ramblers. So folks, don’t throw away those old and broken harmonicas — bring them along to Cathal Johnson. Cathal Johnson will host a harmonica workshop on August 18 and 19 at the Forge Arts Centre on New Road. Starting at 11am to 1pm with a lunch break and back at 2pm to 3pm on both days. The workshop will include learning to bend notes, tongue techniques and embouchure, learning a blues or Irish tune, harmonica care and maintenance, with written and audio material included. Cathal will also include some harmonica repairs. Attendees please bring the key of C major. Harmonicas are available for sale at specially reduced rates on the days. Cost for the two day workshop is €150. Concession rates, €120. Ten places available only. Cathal will also play with Patrick Bergin and The Dominic Street Ramblers at the Crane Bar on Sunday, September 15.